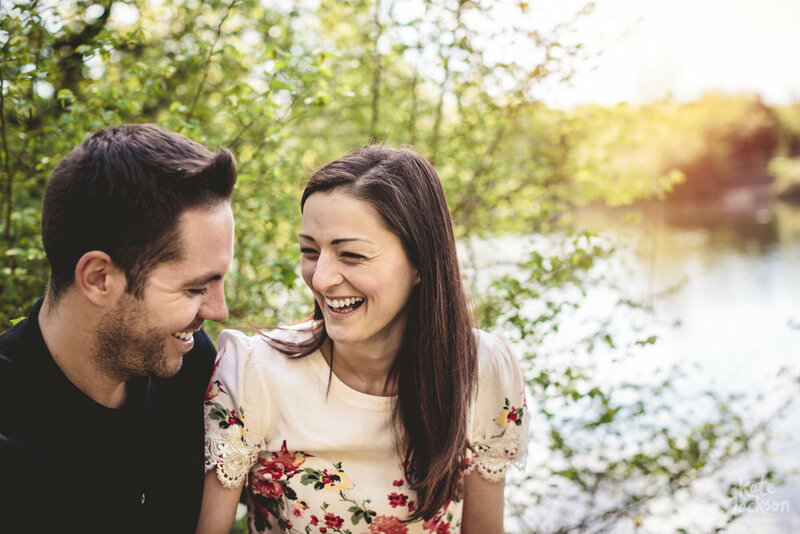 Kirsten & Dan are having a super relaxed destination wedding in Greece in August, and guess what - I'm the lucky lady that gets to be their wedding photographer. I can't tell you how excited I am to photograph what I know is going to be a totally amazing and relaxed wedding day. Plus I get to lounge by the pool in Skiathos for a couple of days to recover too. WINNER! I'm even taking my mum for a little holiday. She is over the moon excited. Probably not as much as Kirsten & Dan are about their wedding day though. In March we went for a little wander in the woods for their engagement shoot and they even brought along their cute pooch Reggie (who admittedly stole the show a little, no one can deny he is the cutest pup ever). It's taken me a little while longer than usual to blog this one because the diary has been jam packed with weddings & engagement shoots but it's here now and I am so happy to share it. It was one of those rare Spring days where the sun was shining and it was so bloomin' lovely, if anything we'd have probably gone as far as to say it was TOO sunny (yeah I know, I just said that). We met at Kingsbury Water Park, one of Kirsten & Dans favourite spots to walk Reggie, and as it turned out somewhere Dan liked to do a bit of fishing too! It was super relaxed and we just walked chatted and I snapped away as I do. 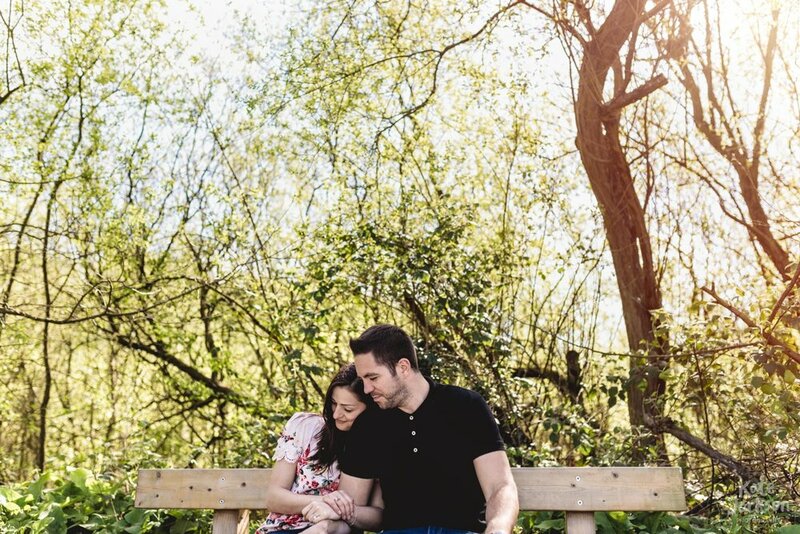 "We had a brilliant day having our engagement shoot with Kate around Kingsbury Water park. She is lovely and friendly and made us feel totally at ease whilst she was taking our photograph. We took our dog Reggie with us to be part of our photos and Kate did a great job of including him in the shots too! We are chuffed to bits with the outcome of our photographs. We felt that she really captured our relationship and our personalities (including Reggie's). We would definitely recommend Kate to anyone looking to capture those special moments and we can't wait for her to take the photographs of our destination wedding in Greece." Kirsten & Dan are tying the knot at Kassandra Bay Resort & Spa on the Greek Island of Skiathos this August and I can't bloomin' wait! Having a destination wedding just like Kirsten & Dan? Get in touch with me for a custom quote on destination wedding photography packages, I would love to hear from you! You know how it goes, have camera, will travel. I'm a Birmingham based professional Wedding Photographer offering UK Wide fun, informal & relaxed wedding photography services. I cover the Midlands, Warwickshire, and the Cotswolds as well as the rest of the UK. Whether you are getting married in London, Manchester, Sheffield, Scotland & Wales I'll be there. I'm all about the fun and celebration of your day. I am more than happy to travel further afield and offer destination wedding photography packages (just like I am for Kirsten and Dan - hint hint).